Comment	 Located in the constellation Tuscana, the Small Magellanic Cloud (SMC/NGC292) is an irregular galaxy that is a member of the local group of galaxies. 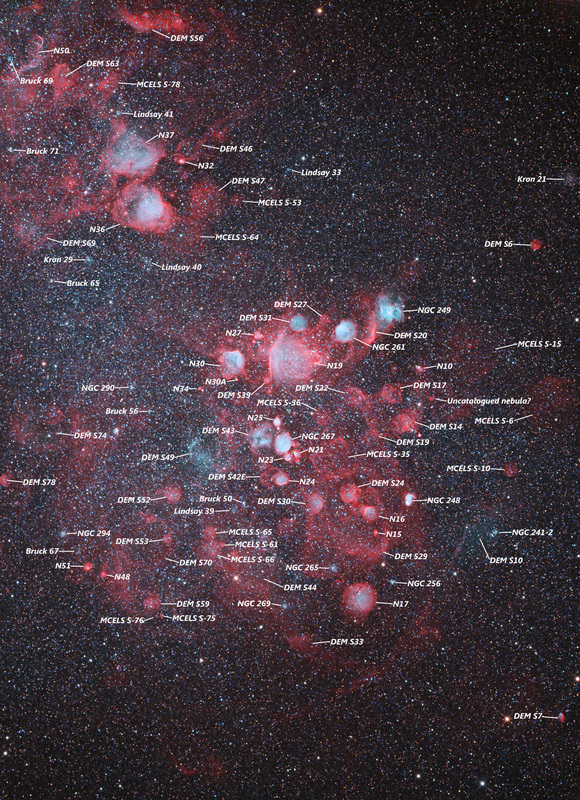 The galaxy contains several star clusters and active star forming redish-pink HII emission nebulae. Here the south-western portion of the galaxy is presented, roughly centered on the open star cluster NGC267 in which is encased in oxygen atoms (teal/blue coloured nebula). The field also contains other prominent nebulae and star clusters NGC249, NGC261, NGC248 and NGC265. An annotated image produced by Sakib Rasool with the assistance of professional astronomer Jordan Zastrow Tushman is available here for reference. Thanks Sakib and Jordan.